A cross-platform interchange is a type of interchange between different lines at a metro (or other railway) station. The term originates with the London Underground; such layouts exist in other networks but are not commonly so named. In the United States, it is often referred to as a "cross-platform transfer". This configuration occurs at a station with island platforms, with a single platform in between the tracks allocated to two directions of travel, or two side platforms between the tracks, connected by level corridors. The benefit of this design is that passengers do not need to use stairs to another platform level for transfer, thus increasing the convenience of users. A cross-platform interchange arrangement may be costly due to the complexity of rail alignment, especially if the railway designers also arrange the track with flyovers (which is typically done to increase efficiency). A common two-directions cross-platform interchange configuration consists of two directions of two different lines sharing an island platform, and the respective return directions of both lines sharing a different island platform in the same station complex. Common cross-platform interchanges allow passengers to change trains without changing to another platform. This applies at places where trains of different directions meet in minor and major hubs, but this arrangement is only found at some interchange stations in metro and other rail networks worldwide. Some railway lines, usually in more congested areas, also offer cross-platform interchanges between different categories of trains, for example between express and stopping ("local") trains. For instance, this kind of interchange is used at many European railway minor hubs to connect fast trains to local feeder services, as well as surface sections of suburban lines like the RER E in Paris or the Metro North Hudson Line in New York State. However, local–express interchanges are found in only a few metro networks, such as Chicago, Chengdu, London, New York City, and Philadelphia. The New York City Subway system has numerous stations facilitating cross-platform transfers between local and express trains, typically using pairs of island platforms, each serving express trains on one side, and local trains on the other side, with both alternatives headed in the same direction. As express and stopping trains usually head for different directions, cross-platform interchange between different train categories (e.g. interchanges between metros and railways) is commonly combined with cross-platform interchanges between different lines. In some, but not all, cases, the trains are coordinated in the timetable. In the case, the cross-platform infrastructure offers the possibility of easily changing trains, independently from the waiting time for the second train. In metro systems with short headways, waiting time is small, but such an noncoordinated approach could reduce the advantages of stairless cross-platform interchange in railway networks with less dense train traffic. A more advanced approach involves the coordination of the lines' timetables to reduce the scheduled changing time, either from one line to the other, or, ideally, bidirectionally, between both trains at the same time. This concept is widely used in Dutch, German, and Swiss railway networks, where trains of different lines meet at the same platforms in numerous hubs all over the country. Most advanced are coordinated cross-platform interchanges wherein interconnected trains also wait for each other to 'guarantee' scheduled interchanges, even in the event of modest delays. In order to still ensure on-time running across the network, additional waiting time for trains is usually limited to a certain period of time depending on general network performance, further connections to be guaranteed, train category, train line, and a balanced consideration of other factors. In practice, most railways coordinating cross-platform interchanges define a certain waiting time window for each 'guaranteed' interchange. Some railway operators will briefly delay train departure signals to allow imminently arriving passengers time to interchange. For example, the Vienna U-Bahn metro signals train drivers to wait briefly, by operating a special white light signal triggered by the approach of an interchange train on another track. In most cases, only cross-platform interchanges used for both directions of travel are listed, with some exceptions. Amsterdam metro network includes cross-platform interchanges at Van der Madeweg station between metro lines 50 and 53 and eventually in the future also at Amsterdam South station between metro lines 50 and 52. Further, cross-platform connections are offered at Amstel station between metro lines 51, 53, 54 and suburban services of Netherlands Railways. At Newmarket Station, there are three lines serving two island platforms. Western Line services use the centre line (which can serve both platforms) allowing cross-platform interchange with Southern Line services which use the outer lines. By 2011, Barcelona metro only offers one cross-platform interchange between metro lines L4 and L11 at Trinitat Nova station where both lines terminate on one track each side of the shared island platform. Guogongzhuang station offers cross-platform interchange between Line 9 and Fangshan Line. National Library Station offers cross-platform interchange between Lines 9 and 4. In addition Nanluoguxiang station (Lines 8 and 6), Zhuxinzhuang Station (Changping and Line 8), Beijing West Railway Station (Lines 9 and 7), Yancun East (Fangshan Line and Yanfang Line) offer cross-platform interchange. The Berlin suburban rail network includes cross-platform transfers at Berlin East and at Baumschulenweg / Schöneweide, Bornholmer Straße, Gesundbrunnen, Treptower Park and Wannsee suburban railway stations. Berlin metro services offer cross-platform connections at Mehringdamm (metro lines U6/U7), Nollendorfplatz (metro line U4 with outbound lines U1/U3) and Wittenbergplatz (metro lines U2/U3, outbound also U1) metro stations. Additionally, Wuhletal station offers cross-platform interchanges between lines S5 of Berlin suburban rail and U5 of Berlin metro. Jungfernheide metro station was built for cross-platform interchanges between line U7 and an extended line U5 towards Tegel Airport; the extension plan was abandoned following the decision to replace Tegel Airport with Berlin Brandenburg Airport. A part of one of the U5 tunnels is used by Berlin firefighters for fire and rescue training in a metro tunnel with an original train taken out-of-service. Similar provisions were also made at Schloßstraße metro station for cross-platform interchanges between line U9 and a never realised line U10. In Bochum's light rail and tram (operated by Bogestra) network, a cross-platform interchange is offered at Bochum Hauptbahnhof station between light rail line U35 and sub-surface tram lines 302 and 310 on the lower level of the underground light rail station complex. U35 and 302/310 services to the south and southeast, and to the north and north-east stop at the same platforms. At the underground level of the MBTA's North Station, the inbound platforms of the Orange Line and Green Line are arranged to allow an easy cross-platform interchange. Other transfers at this station (between the subway lines and the MBTA's bus and/or commuter rail lines) require passengers to change platform levels. The Green Line portion of Park Street station is a cross-platform interchange among the "B", "C", "D", and "E" branches. A similar situation also exists at the Kenmore station, except for the "E" line, which does not pass through that station. Brussels South railway station offers an interesting example of double-level cross-platform interchange, where the goal is to make it easier for passengers to "double back". The metro and premetro lines interweave so that, for example, one can arrive on the metro 2 or 6 from the north-east, walk across the island platform, and catch a tram 3 or 4 going south-east. Passengers making this journey in the opposite direction use the level below. Similar cross-platform interchanges offers Beekkant station between metro lines 1/5 and 2/6; in this area, lines 1/5 run on the right while lines 2/6 run on the left due to historical layout when formerly line 1B between Herrmann Debroux and Roi Baudoin stations branched off line 1B (running between Stockel and Erasme stations) and line 1A needed to change driving direction at Beekkant station. At Brussels North premetro station cross platform interchange is offered between tram lines 25 and 55 coming from Schaerbeek to the premetro lines 3 and 4 towards the city center. Basarab station of metro lines M1 and M4 is the only cross-platform interchange in the Bucharest metro network where lines cross each other. Plaza Miserere provided cross transfer interchange between subway line A and suburban railroad line Sarmiento. There is a never used cross-platform interchange between lines A and D at Plaza de Mayo station and three abandoned cross-platform interchanges: at Primera Junta station between line A and the former tram service towards Lacarra avenue and at San José station on line E between the branch going to Bolívar station and the closed branch to Constitución station where another cross-platform interchange was provided between lines C and E. Suburban lines Sarmiento, San Martín and Roca offers many cross-platform interchanges between express and local services on their 4 track stretches. Charleroi premetro includes two stations, Beaux-Arts and Waterloo, with possible cross-platform interchanges. Cross-platform interchanges between different train categories in Xipu Railway Station, Chengdu. The double track of the urban railway (Line 2 of Chengdu Metro) is in the middle, while the double tracks of national rail transport system (Chengdu–Dujiangyan Intercity Railway) are on both sides. Xipu Station in Chengdu provides cross-platform interchange between Line 2 of Chengdu Metro and Chengdu–Dujiangyan Intercity Railway of the national rail transport system. It is the first implementation of cross-platform interchanges between different train categories in China. Metro only cross platform interchanges exist between Lines 2 and 4 at Chengdu University of TCM & Sichuan Provincial People's Hospital Station and outbound direction interchanges between Line 3 and Line 10 at Taipingyuan Station. In the Chicago 'L' metro network, Howard, Wilson, Belmont and Fullerton stations offer cross-platform interchange in the same direction between different lines. Line 5 and Line 6 of the Chongqing Rail Transit offer a paired cross-platform interchange for passengers transferring among 4 directions between the two lines at Ranjiaba and Dalongshan stations. The only cross-platform interchange of the Cologne premetro network is Ebertplatz station, where passengers can change easily between high and low floor lines sharing an island platform for each direction. The Copenhagen suburban network contains cross-platform interchanges between circle line F and lines B, C, E at Hellerup station. The Dalian Metro has a cross platform interchange between Line 1 and Line 12 at Hekou Station. Duisburg premetro network includes two cross-platform interchange stations, Duisburg Main Railway Station for same-direction interchange and König-Heinrich-Platz station for opposite-direction interchange. Düsseldorf premetro network contains a four-track route between Düsseldorf Main Railway Station and Heinrich-Heine-Allee station comprising two island platforms for same-direction cross-platform interchange at each station; while at both mentioned stations, the two platforms are located parallel, they are built one above the other at both intermediate stations. Essen premetro network includes two stations with cross-platform interchange on two parallel island platforms at Essen Main Railway Station and Essen Rathaus station; cross-platform connections at Essen Main Railway Station are between standard-gauge premetro lines and metre-gauge sub-surface tram lines. At Konstablerwache station, Frankfurt's suburban train lines S1 to S6, S8 and S9 and Frankfurt premetro lines U6 and U7 share one island platform for each direction, with the suburban railway (inner) side of the platforms being much longer than for the premetro. Also, the premetro station located at Frankfurt (Main) Main Railway Station was once designed for cross-platform transfers between different Frankfurt premetro lines but is now only used by premetro lines U4/U5 running along the same corridor. Guangzhou Metro offers three two way cross-platform interchanges by 2016, between Line 2 and Line 3 at Jiahewanggang Station, between Line 8 and the extended Guangfo Line at Shayuan Station and one between both branches of Line 3 at Tiyu Xilu Station. At Tiyu Xilu Station the northern section of Line 3 terminates at the center track serving both island platforms connecting to the southern section of Line 3 stopping at the outer tracks. In 2016, a single direction cross platform interchange started operating between the westbound Line 7 and northbound Line 2 trains at Guangzhou South Railway Station. Hamburg metro offers cross-platform interchanges at Barmbek (between circle and branch of metro line U3), Berliner Tor (between metro lines U2/U4 and U3), Kellinghusenstraße (between metro lines U1 and U3) and Wandsbek-Gartenstadt (between metro lines U1 and U3) metro stations; all cross-platform interchanges are also timetable coordinated to make it as easy and convenient for the passengers as possible. Another cross-platform interchange is used at the northwestern terminus of metro line U1 at Norderstedt Mitte station where metros use the outer tracks and interconnect with the non-electrified suburban line A2 of AKN private railway company terminating on the center track in between the two island platforms. Hamburg suburban railway offers cross-platform interchanges at Altona station and Hamburg Main Railway Station ensuring short connections for four of five branches to both inner city routes. Hangzhou Metro's East Railway Station and Pengbu Station offer paired cross-platform interchange between Line 1 and Line 4. Qianjiang Road Station offers a single cross-platform interchange between Line 2 and Line 4. There is a provision for another paired cross-platform interchange at West Lake Cultural Square and Wulin Square Stations between Line 1 and the planned Line 3. Another provision for cross-platform interchange was also made at Coach Center Station between Lines 1 and the planned Line 9. More cross-platform interchanges are under construction including one at University of Eastern Medicine Station between Lines 4 and 6. Hanover premetro offers two cross-platform interchanges, one at Hanover Main Railway Station and one at Aegidientorplatz station. In the Mass Transit Railway (MTR) system of Hong Kong, cross-platform interchange stations first appeared at Mong Kok and Prince Edward stations when Tsuen Wan Line was opened. The interchange is two stations long, with inverse cross-platform interchange assigned to Prince Edward and same-direction interchange to Mong Kok as large volumes of traffic had been anticipated in both modes. Popular with passengers, this design was repeated on Admiralty Station when the Island Line was opened to deal with the heavy opposite-direction interchange anticipated. Years later, another interchange spanning Tiu Keng Leng Station (same direction) and Yau Tong Station (opposite direction) was built to the same configuration as Mong Kok and Prince Edward. The Ma On Shan Line is specifically designed to follow right-hand traffic rules unlike other railway lines in Hong Kong to enable a single-direction cross-platform interchange at Tai Wai Station to the East Rail Line while keeping all platforms at roughly the same height. Another configuration found in Lai King Station makes commute in both directions more convenient by aligning both tracks leading towards city next to each other on one level, and both tracks leading away from city next to each other on the other level. The configuration for North Point Station is similar to provide convenience for passengers travelling towards city, although the distance between the two platforms are longer compared to other stations. Before the MTR-KCR merger in 2007, Nam Cheong Station was served by MTR's Tung Chung Line and KCR's West Rail line. Due to the different fare system, platforms of southbound Tung Chung Line and northbound West Rail were separated by wall even though they were at similar elevations. After the merger, some sections of the wall was demolished in order to provide cross-platform interchange between southbound Tung Chung Line and northbound West Rail Line. However, this arrangement does not serve the dominant rush hour passenger flows, which are between New Territories and Hong Kong Island, as well as between Lantau Island and Tsim Sha Tsui. By connecting East Rail and West Rail lines at Hung Hom without through-running, both lines terminate there alternating on both East/West Rail platforms to offer cross-platform interchanges. At Sunny Bay Station, passengers on the Tung Chung Line from the city can make a cross-platform interchange to a Disneyland Resort Line Train. However, the inverse is not the case, as passengers returning to the city from Hong Kong Disneyland need to use an overpass to catch a Hong Kong-bound train. The PATH system, serving the New York metropolitan area, contains two cross-platform interchanges in Jersey City and Newark, New Jersey. At Journal Square Transportation Center in Jersey City, there is a cross-platform transfer between terminating Journal Square–33rd Street and Journal Square–33rd Street (via Hoboken) trains, and through Newark–World Trade Center trains. At Pennsylvania Station in Newark, there is a cross-platform interchange between Newark–World Trade Center and NJ Transit trains bound for New York City. Newark Penn Station also contains a cross-platform interchange for NJ Transit trains coming from New York City. There is a cross-platform interchange between the Kyoto Municipal Subway Tozai Line and the Keihan Keishin Line at Misasagi. Putra Heights is an interchange station between 2 LRT lines-Sri Petaling Line and Kelana Jaya Line. In London's deep-level tube network, these usually occur in pairs for both directions of two lines. This allows for extremely quick and convenient interchange. The effect is that the two lines, despite having completely separate operation, can be treated by passengers as branches of a single network. Several slow and fast services have multiple cross-platform interchanges. Finchley Road offers cross platform transfers between the fast Metropolitan line and slow Jubilee line at surface level before diverging from Wembley Park. Acton Town, Barons Court, Turnham Green and Hammersmith all have cross platform transfers between the fast Piccadilly line and the slow District line. Mile End has cross platform transfers between the District/Hammersmith & City and Central lines at sub-surface level. Stratford has cross platform between the Central line and National Rail TfL Rail services. For the deep-level interchanges the term "same level interchange" is sometimes preferred as there is invariably an intermediate circulating area between the platforms. Convenient same level interchanges feature at various Victoria line stations, including Stockwell with the Northern line and Euston with the Bank branch of the Northern line; Oxford Circus with the Bakerloo line; Finsbury Park with the Piccadilly line; and Highbury and Islington with the Northern City Line. There is also a cross platform interchange at Baker Street between the Bakerloo and Jubilee lines. Lisbon Metro has cross unidirectional platform interchanges at Baixa-Chiado Station, from northbound blue line to southbound green line and at Campo Grande station from southbound green line to southbound yellow line. Lisbon regional rail has cross-platform interchanges on the belt line within Lisbon as well as on the Sintra line, where Sintra line trains connect with Azambuja line trains. Madrid metro uses cross-platform interchanges mainly for easy transfer between urban and suburban sections operated separately on metro lines 7 (Estadio Olimpico), 9 (Puerta de Arganda) and 10 (Tres Olivos). At Casa de Campo station, metro lines 5 and 10 are interconnected cross-platform with line 5 terminating on center track in between the island platforms shared with line 10. At Principe Pio station, metro lines 6 and 10 share an island platform for each direction. Further applications of cross-platform interchanges connect only one direction of each line, for example at Pinar de Chamartin station between metro lines 1 and 4. Melbourne's suburban railway offers cross-platform interchanges along the City Loop according to the operation concept depending on time and day. All three underground stations consist of four tracks and two island platforms one above each other. Burnley Group passengers can also change between Flinders Street direct and City Loop services at Richmond station on weekday mornings. Camberwell station operates as a partial cross-platform interchange off-peak, when Alamein services operate as shuttles from Camberwell. During the day, terminating trains from Alamein drop passengers off (before proceeding to a reversing track west of the station) on platform 2, which connects to a city-bound Belgrave/Lilydale line train on platform 1. At night, trains from Alamein terminate and reverse on platform 1, allowing cross-platform transfers for passengers from the city arriving on platform 2 on a Belgrave/Lilydale service. Cadorna FN station on Milan Metro serves as interchange between M1 and M2 lines (the other one is Loreto). Each line is served by a couple of side platforms located on the same level. This provides a direct link between M1 northbound platform (towards Sesto 1° Maggio) and M2 southbound platform (towards Abbiategrasso or Assago Milanofiori Forum). All the other connections have to be done through the upper level mezzanine. Two transfer stations in Montreal feature cross-platform interchange. At Lionel-Groulx station, the upper platforms serve Henri-Bourassa or Montmorency (Orange Line 2) and Honoré-Beaugrand (Green Line 1) trains, entering downtown; the lower platforms serve Côte-Vertu (Orange Line 2) and Angrignon (Green Line 1) trains, leaving downtown. Since most transferring passengers are either entering or leaving downtown, most transfers at this station are cross-platform. At Snowdon station, however, the outbound Orange Line platforms are at the same level as the Blue Line terminal platform, with the inbound Orange Line platforms linked to the Blue Line departure platform, reducing efficiency. This is explained because the Blue Line was originally planned to be continued west of the station, in which case this arrangement would have provided the same benefit as the arrangement at Lionel-Groulx. Kitay-gorod has the cross-platform interchanges between Tagansko-Krasnopresnenskaya and Kaluzhsko-Rizhskaya lines. Tretyakovskaya offers passengers to cross between Kaluzhsko-Rizhskaya and Kalininsko-Solntsevskaya lines. Kuntsevskaya has a cross-platform interchange between westbound Arbatsko-Pokrovskaya line platform and termination platform of Filyovskaya line. Kashirskaya – cross-platform interchange between Zamoskvoretskaya and Kakhovskaya lines. Mülheim located roughly in the centre of the Rhein-Ruhr premetro network offers selected cross-platform interchanges at Mülheim (Ruhr) Main Railway Station. Munich metro offers coordinated cross-platform connections at both Scheidplatz (metro lines U2/U3) and Innsbrucker Ring (metro lines U2/U5) metro stations; all same-direction connections are optimised, so that usually U2 and U3 respectively U5 trains of the same direction arrive, stop and depart at the same time. Neuperlach Süd is a combined station for Munich metro and Munich suburban rail. Original plans intended cross-platform interchanges in both directions at parallel island platforms. However, Munich suburban rail is still single-track there and offers therefore only cross-platform interchange in the outbound direction and from outbound (terminating) Munich metro U5 services to inbound Munich suburban rail S7 services. Although possible, the arrival and departure times of both lines are not matched together. Within the Munich S-Bahn (suburban rail) network, Westkreuz, Giesing, Berg am Laim and Besucherpark junction stations offer cross-platform interchanges for transfers between both branches. Under discussion are cross-platform interchanges in the same running direction for connecting the central bypass to the existing trunk route at least at Laim and Leuchtenbergring stations. At Donnersbergerbrücke suburban station, cross-platform interchanges can be made in the same running direction between the S-Bahn lines along the trunk route and lines S7, S27, BOB; although not interconnected by timetables. However, the S-Bahn lines along the trunk route run frequently during most of the day: every 2 to 6 minutes on lines except S7, and every 2 to 4 minutes including the S7. At Ostbahnhof, cross-platform interchanges have been possible since 2004 between regional trains from Rosenheim and Mühldorf to S-Bahn lines towards Ebersberg, Erding and Munich Airport (only in these directions). Further cross-platform interchanges between Munich S-Bahn and regional trains can be made at Freising, Petershausen, Geltendorf, Grafing Bahnhof and Markt Schwaben stations, as Munich S-Bahn partly runs on mainline tracks anyway. Nanjing Metro's Nanjing South Railway Station offers cross-platform interchange between Lines 1 and 3 and single direction cross platform interchange between Line S1 and Line S3. In addition, a cross platform interchange is available at Xiangyulunan Station between Line S1 and Line S9, and Konggangxinchengjiangning Station between Line S1 and Line S7. A paired cross platform interchange is available between Line 1 and Line 2 at Nanning railway station and Chaoyang Square station. The New York City Subway has many three- or four-track lines with local and express service. Cross-platform interchanges are located in numerous locations throughout the system to allow for convenient transfers between express and local trains. In general, express trains run on the inner pair of tracks and bypass local-only stations, while local trains run on the outer pair of tracks and stop at every station. Express stations typically have island platforms between the express and local tracks, allowing passengers to quickly switch between trains heading in the same direction simply by crossing a platform. The Queensboro Plaza station contains a same-directional cross-platform transfer between the IRT Flushing Line (7 and <7>​ trains) and BMT Astoria Line (N and ​W trains). The Hoyt–Schermerhorn Streets and Jay Street–MetroTech stations in Brooklyn allow cross-platform interchanges between the G train of the IND Crosstown Line with the A and ​C trains of the IND Fulton Street Line, the F train of the IND Culver Line, respectively. The Fulton Street Line does not have any track connections with the Crosstown Line, and the Fulton Street Line's track connection to the Culver Line is rarely used. At the Seventh Avenue–53rd Street station on the B, ​D​, and E trains, there are no track connections between the E train on the IND Queens Boulevard Line and the B and ​D trains on the IND Sixth Avenue Line. At Seventh Avenue, there is also a feature unique to the system, as anti-directional cross-platform interchanges can be made here (albeit between trains heading in the same general cardinal direction, due to the track layout near the station). The DeKalb Avenue and Prospect Park stations on the BMT Brighton Line (B and ​Q trains) in Brooklyn feature cross-platform interchanges to the BMT Fourth Avenue Line (R and ​W trains) and the BMT Franklin Avenue Line (S train), respectively. The Lexington Avenue–63rd Street station in Manhattan has a cross-platform interchange between the two 63rd Street Lines (F​ and Q trains). The Jamaica hub station of the Long Island Rail Road features coordinated cross-platform interchanges among the many services that stop there. During peak periods, this is enhanced by having three trains arrive at the same time, and a cross-platform interchange can be done by walking across through the train on the center track, which is waiting with its doors open on both sides. In the absence of this middle train, interchanging passengers must walk to one end of the long platform, walk to another platform, and then walk back in order to move between trains on the outer two tracks. Nizhny Novgorod metro's Moskovskaya station is prepared to offer cross-platform interchanges at a later point of time between both metro lines; before 2012, both lines terminate there and are connected to through running operation eliminating any needs to change trains. After an extension was completed for Line 1 beyond Moskovskaya station, cross-platform interchange was put in use to transfer between both lines. A paid cross-platform connection exists between the Port Authority Trans-Hudson rapid transit system and Amtrak and NJT trains at Newark Penn Station, allowing passengers to switch to trains to the World Trade Center. Nuremberg metro includes one cross-platform interchange between metro lines U1/U11 and U2/U21/U3 at underground Plärrer metro station where the outbound metro platform is located above the inbound. The Osaka Metro has a cross-platform interchange between the Midosuji Line and the Yotsubashi Line at Daikokuchō, where the platforms are at the same level. Kintetsu Railway also has a cross-platform interchange between the Nara Line and the Osaka Line at Tsuruhashi, where the platforms are at the same level. Hanshin Railway has a same direction cross-platform interchange between the Namba Line and Hanshin Main Line at Amagasaki. Paris Métro has cross-platform interchange at La Motte-Picquet – Grenelle stations between Paris Métro line 8 and line 10. RER E at Val de Fontenay. Its final station Chelles - Gournay also offers cross-platform interchange between local RER E trains and express Transilien P trains. The SEPTA Broad Street Line has cross-platform interchanges between local and express trains at Olney Transportation Center, Erie, Girard, Spring Garden, Race-Vine, City Hall, and Walnut-Locust. Cross-platform interchange is available between Line 2 and Line 3 at Wusi Square Station. A provisions for cross platform interchange between Line 3 and the under construction Line 8 were made at Qingdao North Railway Station. The suburban services in the German Rhine-Ruhr area include cross-platform interchanges at Dortmund-Dorstfeld station between lines S2 and S4 (including coordinated timetables), at Düsseldorf Main Railway Station and at Essen Main Railway Station. For information about the Rhine-Ruhr Stadtbahn (premetro) network, see among the related cities (Bochum, Dortmund, Düsseldorf, Essen, Mülheim). Three adjacent stations of the BART system, namely Oakland City Center / 12th Street, 19th Street / Oakland and MacArthur stations, feature cross-platform interchange between the Antioch–SFO/Millbrae (yellow) line and the Richmond-Fremont (orange) line. The trains are so timed that the trains bound for Pittsburg/Bay Point and Richmond arrive at the same time at 19th Street Oakland station; the trains might arrive at the same time at the other stations too, but that is not guaranteed. Only MacArthur station has enough platforms to enable such "timed" transfer between trains bound for San Francisco Airport/Millbrae and for Fremont at the extremes of the system. The forced transfer (between the main BART systems and eBART) for continuing passengers at a transfer platform east of Pittsburg/Bay Point has a cross-platform interchange to traditional service. An intermodal cross-platform interchange exists at the Millbrae Intermodal Terminal in Millbrae, California, between Caltrain commuter rail service and BART. Vicuña Mackenna metro station is the only in the metro network of Santiago de Chile offering cross-platform transfer; the through-running line 4 and its shuttle line 4A are interconnected cross-platform here. Line 4A uses the center track between both island platforms, with line 4 stopping on the outer tracks. Seoul Subway Geumjeong Station offers cross-platform transfer between Line 1 local services and all 4 services. Gimpo Airport Station also offers cross-platform transfer between all Line 9 services and AREX local service. Also several Line 1 stations offer cross-platform transfer between trains heading to Incheon or Cheonan/Sinchang. Oriental Sports Center Station offers cross-platform interchange between Lines 6 and 11. In addition, Hongqiao Railway Station provides cross platform interchange between Lines 2 and 17. While Hongqiao Airport Terminal 2 Station provides a single direction cross-platform interchange between the Line 2 Pudong International Airport bound trains and Line 10 Xinjiangwancheng bound trains. Shenzhen metro network includes cross-platform interchanges at Laojie station one direction on top of the other and at Huangbeiling station with two parallel island platforms. Cross platform interchanges also have started operation in Chegongmiao (Lines 7 and 9), Hongshuwan South (Lines 9 and 11) and constructed for future use at Huangmugang and Nanyou stations. The Mass Rapid Transit system in Singapore has a similar two-station transfer arrangement to allow quick transfers between North South and East West lines. Both City Hall MRT Station and Raffles Place MRT Station have double underground island platforms stacked on top the other, allowing commuters to switch trains to a different line by walking across the same platform at the appropriate station. Jurong East MRT Station has a less complicated arrangement, with the terminating rail for the North South Line aligned between that of the East West Line, allowing commuters to alight and board simultaneously on either side, with an additional rail for the North South Line used during peak hours. Tanah Merah MRT Station also has a less complicated arrangement, with the terminating rail for the East West line Changi Airport Extension aligned between that of the East West line Main Line, allowing commuters to alight and board simultaneously on either side. The Bayfront MRT Station is also a cross-platform interchange with double underground island platforms between the Marina Bay branch of the Circle Line and Downtown Line; the original plans for Promenade MRT Station contained a similar arrangement but the existing Circle Line tracks to and from Dhoby Ghaut need to be crossed at the same levels by Downtown Line trains. Tekhnologichesky Institut offers cross-platform interchange between lines 1 and 2. Sportivnaya will have a cross-platform interchange between lines 5 and 8, but line 8 is not built yet. Stockholm Metro includes cross-platform interchanges at T-Centralen (Main Railway Station), Gamla stan and Slussen metro stations between red and green metro lines, where T-Centralen (Main Railway Station) offers opposite-direction connections while the latter two make cross-platform connections possible in the same direction. Additionally, passengers between Nockebybanan and green metro lines can change cross-platform at Alvik station. The Södertälje Hamn commuter rail station provides optimised transfer between the J40, J41 and J48 lines. The Sydney Trains suburban railway system offers cross-platform interchange at Central between express and local trains to/from Strathfield as well as on the four-track section from Westmead to St Marys along the Western Line, each in the same direction. Selected cross-platform interchanges can also be made at Glenfield, Granville, Hornsby, Lidcombe, Redfern, Revesby and Town Hall. Cross-platform interchange is also available between Sydney Metro and Sydney Trains services at Chatswood. Guting Station, a main interchange station of Taipei Metro, provides cross-platform interchange between the Xindian Line (Green Line) and Zhonghe Xinlu Line (Orange Line) in Taipei, Taiwan. The Taipei Metro has four stations for cross-platform interchanges: Chiang Kai-shek Memorial Hall Station (between the Songshan-Xindian Line and Tamsui-Xinyi Line), Ximen Station (between the Songshan-Xindian Line and Bannan Line), Guting Station (between the Songshan-Xindian Line and the Zhonghe-Xinlu Line) and Dongmen Station (between Zhonghe-Xinlu Line and the Tamsui-Xinyi Line). All these stations have two island platforms on different floors, most of them are same-direction cross-platform configuration except Dongmen Station which has an inverse cross-platform. Beitou Station allows for cross-platform transfers for southbound trains only due to differing operating routes. Sadeghieh metro station of Tehran metro offers cross-platform interchanges between both terminating metro lines 2 and 5; while suburban line 5 uses the outer tail tracks of each platform, metro line 2 uses one platform for alighting and the other for boarding. Line 2 uses platforms 2 and 3, and Line 5 uses platforms 1 and 4. Eram-e Sabz metro station also has a cross-platform interchange. It has a cross platform interchange between Lines 4 and 5. Line 4 uses platforms 1 and 4, and Line 5 uses platforms 2 and 3. In the Tokyo Metro, Akasaka-mitsuke Station provides cross-platform transfer between Ginza Line and Marunouchi Line. At Omotesandō Station, transfer between Ginza Line and Hanzōmon Line can be done on its two island platforms at the same level. Shirokane-takanawa Station uses the same way to offer cross-platform interchange between Namboku Line and Mita Line. At Kudanshita Station, cross-platform interchange is possible between a Shinjuku bound Shinjuku Line train and an Oshiage bound Hanzōmon Line train. In JR-East commuter network at Shinjuku Station, transfers between Yamanote Line and Chūō-Sōbu Line use directional cross-platform interchange on two parallel island platforms. Between Tamachi and Tabata, there are cross-platform interchanges between the Yamanote Line and the Keihin-Tohoku Line. At Ochanomizu Station, cross-platform interchange is between Chūō-Sōbu Line and Chūō Rapid Line. In the Tokyu Railway network at Ōokayama Station, cross platform interchange is provided between the Meguro Line and the Ōimachi Line. In addition Naka-Meguro Station provides cross platform interchange is available between the Tōkyū Tōyoko Line and Tokyo Metro Hibiya Line. Vienna metro optimised cross-platform connections at Längenfeldgasse station between lines U4 and U6 by demanding trains to wait as soon as the connecting train is approaching in case of delays or during different train intervals operated; this additional functionality is carried out by a special white light signal demanding the driver to wait. Before line U2 was extended from Schottenring further east, U2 trains terminated at (upper) U4 platform level on a center track sharing platforms with U4 trains on both sides; originally, this station level had been used for merging U2 and U4 lines and consisted of 4 tracks with 2 island platforms, but both platforms were merged to a single island platform after U2 extension opened. Line 2 and Line 4 of Wuhan Metro's Hongshan Square Station and Zhongnan Road Station offer paired cross-platform interchange for passengers transferring among 4 directions of the two lines. The configuration for the two stations is similar to that of Mong Kok and Prince Edward stations in Hong Kong's Mass Transit Railway (see above). Passengers riding on Line 2 from Hankou wishing to reach Wuchang Railway Station, can transfer at Zhongnan Road Station by crossing the platform. Those who going to Wuhan Railway Station, can transfer at Hongshan Square Station by crossing the platform, and vice versa. Two more cross platform interchanges opened in Wuhan at Zhongjiacun Station between Line 4 and Line 6, and Hongtu Boulevard Station between Line 2 and Line 3. Shibalihe Station offers cross-platform interchange between Line 2 and Line 9. Line 2 uses platforms 2 and 3 while Line 9 uses platforms 1 and 4. It already serves the Chengjiao line, which will be part of future line 9. Zhengzhou East Railway Station will provide cross-platform interchange between Line 5 and Line 8. Line 5 uses platforms 3 and 6 while Line 8 uses platforms 4 and 5. The station already serves Line 1, using platform 1 and 2 which on floor -2. Zhangjiacun Station, under construction, will provide interchange between Line 4 and Line 7. Line 4 uses platforms 2 and 3 while Line 7 uses platforms 1 and 4. Line 4 will open in 2020. Dingruijie Station, under construction, end of Line 16, will provide interchange between Line 4 and Line 16. Line 4 uses platforms 1 and 4 while Line 7 uses platforms 2 and 3. Line 4 will open in 2020. Shibalihe Station has already operated for Chengjiao Line. Note: Lines 4 and 5 are under construction while Lines 7 and 8 are preparing to start construction. Line 9 and 16 are still under planning. ^ "Google News". Google. Retrieved 2011-03-16. ^ Interborough Rapid Transit Company (June 2007). IRT Interborough Rapid Transit / the New York City Subway: Its Design and Construction. Lulu.com. ISBN 978-1-4303-2550-5. Retrieved February 27, 2016. ^ "carto.metro.tramway.rer.funiculaire". Franklin Jarrier. Retrieved 2011-11-19. ^ "Gleisplanweb". Christian Stade. Archived from the original on 2011-11-30. Retrieved 2011-11-19. ^ "Google Maps". Google. Retrieved 2011-11-19. ^ "Metro Track Maps". Yuri Popov. Retrieved 2011-11-19. ^ "Sporenplan.nl". Sven Zeegers. Retrieved 2011-11-19. ^ "Urbanrail.net". Robert Schwandl. Retrieved 2011-11-19. ^ "成灌快铁犀浦站正式开建". 成都市官方网站. 2009-08-26. Archived from the original on April 24, 2014. Retrieved 2013-08-08. 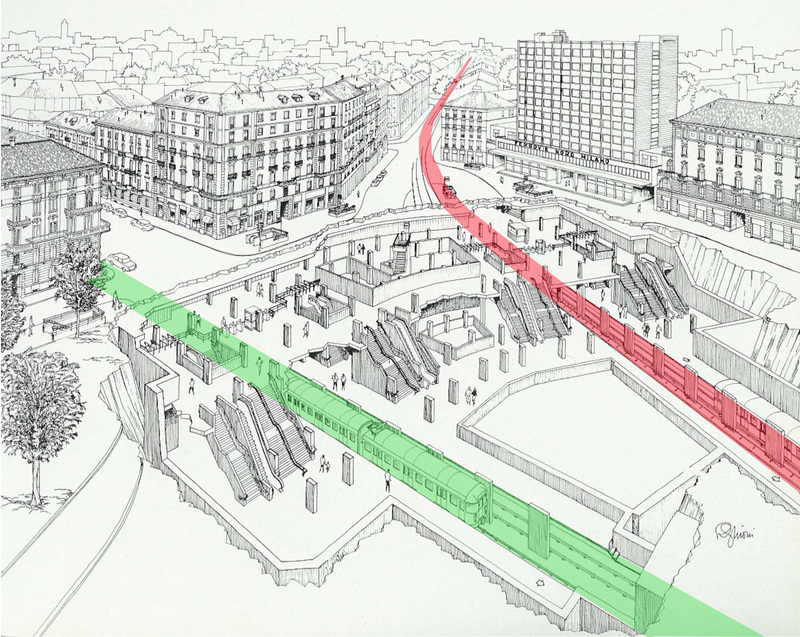 ^ "Station cutaway highlighting M1 (red) and M2 (green) lines". ^ 韩震霞. "江宁一波交通利好来袭 宁句城际有望年底开工_中国江苏网". jsnews.jschina.com.cn. Retrieved 2018-05-06. ^ "Nycsubway.org". Nycsubway.org. Retrieved 2011-11-19. ^ "青岛迎来双地铁时代 2号线东段今开通试运行 - 信网|青岛财经生活服务门户". www.qdxin.cn. Retrieved 2017-12-10. ^ 颜波 (2011-12-17). 2号线最宽地铁站 4条隧道贯通一半 (in Chinese). 长江日报. Archived from the original on 2012-12-06. Retrieved 2011-12-17.